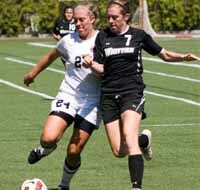 In her second season playing for the Chapman University Panthers in California, Aimee Evans of Hailey has become Chapman's leading scorer after 18 games of the 2010 regular-season soccer schedule. And she has led Chapman to its first home playoff game in six years. That game was played Thursday, Nov. 11 at Wilson Field in Orange, Calif. where Chapman hosted the University of Redlands (10-9). Chapman learned Monday, Nov. 8 that it had received a "Pool B" at-large bid into the 65-team NCAA Division 3 women's soccer tournament. It is Chapman's seventh trip to the postseason, first since 2004. With Evans playing a major role, Chapman (12-6, 8-4 road) posted back-to-back winning seasons for the first time in six years. The Panthers won their final four games, three on the road, by 5-0, 2-1, 3-0 and 4-2. Chapman outscored foes 40-23 including a 3-2 home win over Redlands back in September. Sophomore forward-midfielder Evans (12 goals, 2 assists for 26 points) emerged as Chapman's leader in goals (12), points (26), shots (48) and game-winning goals (4). As a freshman in 2009, the 5-8 striker had 2 goals, 1 assist. She scored Chapman's first goal in a 4-2 road win over the University of LaVerne that ended the regular season Nov. 3. Evans also contributed two goals and two assists in a 5-0 road victory over Southwestern University Oct. 24. With 75 career high school goals, Evans is the third-leading goal scorer in Wood River High School history. She was the leader of the record-setting 18-2-1 Wolverine squad of 2008 that won the school's second straight State 4A tourney consolation title. The daughter of Rich and Juli Evans scored a single-season career best 24 goals for Hailey in 2008, and that's the uniform number she wears for the Chapman Panthers.